We have been writing about the Parking fees loot from various places in the city and day after day the LOOT is increasing. Take this latest incident at Dharmveer Sambhaji Circle (Bogarves) which is under the Cantonment and the Cantonment board has awarded a tender for collection of parking fees. The argument starts, Kal to Rs.20 diya tha aaj 30. Some silence from the Parking guy, he tears a new Rs.20 receipt and hands over. 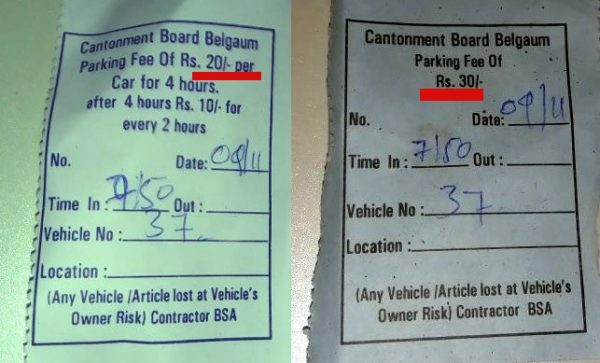 So the point here is the correct parking FEE we assume to be Rs.20 but these great guys have printed the Rs.30 parking tickets as well and they give it first if someone confronts them they have the 20 ticket as well. As per law boards have to be put and FEE has to be mentioned, no where it is put up. The authorities also are not bothered as they get the income from the tender so they are least bothered but when citizens are looted like this they have to come forward and act. No one actually knows the exact Parking Fee, 30 or 20. If the fee in reality was 30 the parking guy would have stood adamant which then is his right, but here he hands over a new Rs.20 ticket. We would request the authorities to tell which is the official and correct parking fee. This is scam, run hand–in-gloves with Cantonment Board! Manages to hoodwink people with false receipts and the board gets it dues on regular basis! You complain and nothing happens! In f at there is no one to complain! New avatar of Smart City, smart thugs! There are no serial numbers on the receipts.. Still they have charging 15Rs each person. But actual price is 5Rs for 2Hrs and 10RS after 2Hrs. Need to take strict action against parking vendor. Even for 2 min waiting charge is 5Rs opposite to Tatkal book ticket office railway station. Railway board have to take against this loot. Could it be that 20 rupees is for the first four hours and 10 rupees for each additional two hours thereafter. 30 rupees may be for the full day? Just saying.